Your endpoints can be the weakest link in your network environment. Secure your endpoints from advanced threats. Protect your corporate information. Continuously monitor and secure your endpoints and your network environment to identify threats and secure your environment - fast. Cybersecurity threats are changing constantly and are becoming more advanced. New and emerging threats can enter your system. Users may be targets of phishing attacks. Detect traditional malware and non-malware attacks in real time. 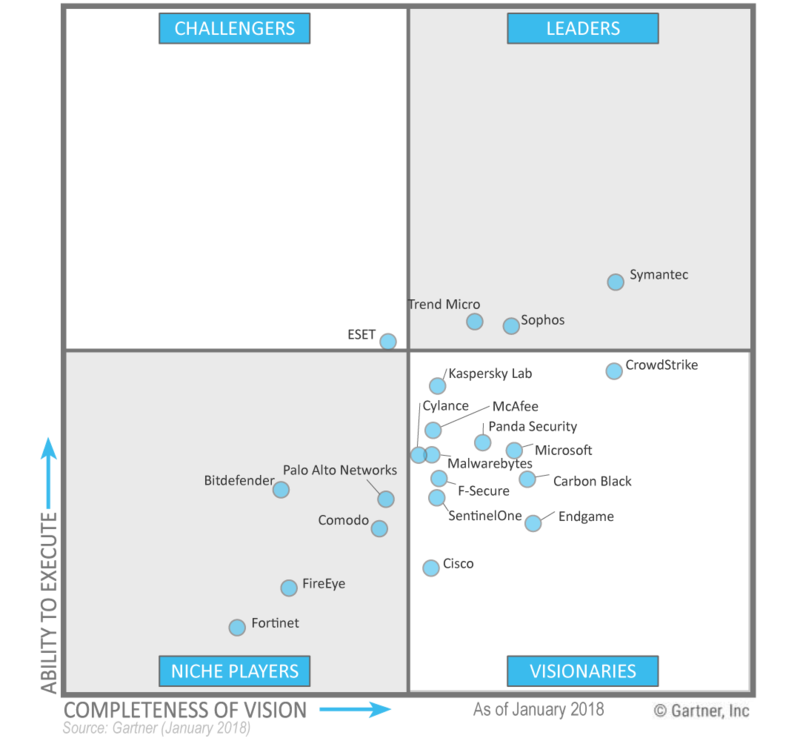 "Carbon Black takes its largest step forward in its second year as a ‘Visionary’ in the 2018 Gartner Magic Quadrant (MQ) for Endpoint Protection Platforms." We offer the best solutions from top vendors in endpoint security to fit your needs and work with your endpoint management tools. Carbon Black provides a comprehensive endpoint security solution. It’s portfolio includes solutions for detection, protection, and response to cyber attacks and components are available on-premise or in the cloud. Solutions include: CB Defense for next generation anti-virus and endpoint detection and response (EDR); CB Response for threat hunting and incidence response for SOC teams; and CB Protection providing application control for servers and critical systems. CylancePROTECT provides artificial intelligence based advanced threat prevention to predict and prevent execution of advanced threats at the endpoints. 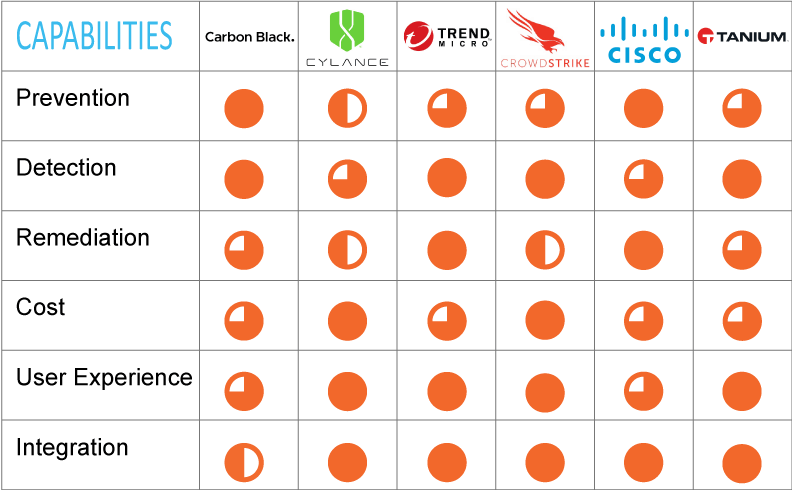 Cylance uses a signature less anti-malware approach that scans executables launched at endpoints, and uses its AI engine to predict its behavior. Trend Micro provided enterprise cybersecurity solutions with a broad range of security capabilities including: anti-malware and advanced threat protection; application control; encryption and data loss prevention (EDL); intrusion protection; integrity monitoring; and machine learning. CrowdStrike provides cloud-delivered endpoint protection including next generation anti-virus, endpoint detection and response, and managed threat hunting. Prevents malware, and malware-free attacks. Provides 5-second visibility and protection across endpoints, and a dedicated team proactively hunting to identify attacks and stop breaches. Cisco AMP for endpoints provides next generation endpoint security to detect, block, and remediate malware across endpoints. Continuously monitors file behavior to uncover stealth attacks and block and remediate threats that come through front line defenses. Tanium endpoint protection platform offers 15-second visibility to secure, control and manage millions of endpoints across the enterprise. Tanium allows you to learn what is happening across your endpoints with plain english query. You can proactively inventory and remediate vulnerable applications quickly.